High density living, the use of technology and the end of summer may all be reasons children are now being robbed of valuable time outside. But this could be to the detriment of the next generation with more and more research showing children's health and wellbeing, and development could be at risk. Not only is the lack of space an issue, with growing bodies needing room to move and explore, the lack of natural light could also be putting children at risk of myopia or nearsightedness. Research by Queensland University of Technology found less than 60 mins per day of outdoor light could lead to children having problems seeing things in the distance. Outdoor play fuels imagination. When children play outside, the 'equipment" is limited, and the imagination is limitless. Children are more likely to invent games when they play outside, and as they do, they learn important skills such as decision making, negotiation, organisation and autonomy. 'Outside" is nature's art gallery. Children develop aesthetic awareness and an appreciation for the beautiful planet the natural world provides by being immersed in it. As sensorial learners, children are hard wired to notice the small details of sights, sounds and textures. Being outside wakes up these senses and cues children to look for the beauty in everything around them. Outdoor play gives busy bodies the most space to move. With more than 30,000 children severely obese in Australia, according to research conducted by Associate Professor Sarah Garnett from Sydney's Westmead Children's Hospital2, giving children time, space and resources to move is critical to the health and wellbeing of our future generations. 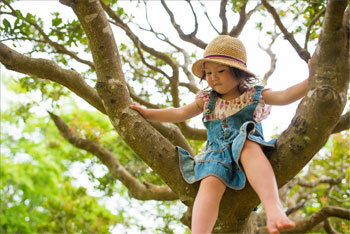 Risky outdoor play teaches resilience. Ever heard the phrase -better a skinned knee than a broken spirit'? Children who experience risk and challenge in outdoor play also have an opportunity to experiment – with physics, with their capabilities, with their capacity – and to develop resilience. Exposure to nature reduces stress. It's also been scientifically proven to significantly reduce ADHD symptoms, such as inattention and impulsivity, according to a University of Illinois study, published in 2004. Being outdoors in nature prevents attention fatigue, and children's stress levels fall within minutes of seeing green spaces. Ms Lucas, says most Community Kids Childcare & Early Learning Centres are designed with large natural outdoor areas for children to learn and thrive. National regulations state childcare centres must provide every child with at least seven square metres of outdoor space. However, Ms Lucas acknowledges that not all homes can be so accommodating. 'There's always ways, though, you can engage and encourage your child to explore outside or the -big blue room' as I like to call it," she says. Try "water painting," in which children paint the side of a building or a tree with a brush and a bucket of water. It exercises arms and upper torso while also teaching about wet and dry, light and dark, and evaporation. Find some dandelions and blow them, watching the tiny feathers dance in the wind.